1815 The first proposal was made for bridging the harbour and discussions continued for many years. 1908 A Royal Commission was convened to examine options for crossing the harbour, whether bridge or tunnel; if a bridge was selected, the previous proposal ought to be favoured. "The main piers supporting the cantilevers will be situated near the water's edge on Dawes Point and Milson's Point, and will be founded on solid sandstone about 20ft. below water. These piers are 1600ft. apart centre to centre. The 'anchor' piers are distant 500ft. from the main piers. The cantilevers are balanced arms of heavy braced steel work, which are built out on either side of the towers over the main piers, the construction being carried out by means of 'bridge erecting travellers.' It will be understood that the weight of the shore arm and 'anchor pier,' to which the shore arm is attached by means of steel eye. bars secured to a steel grillage built into the anchor pier, counterbalances the weight of the bridge jutting out over the water. "The 'harbour' arms of the cantilevers each extend 500ft. from the shores, and the centre portion of 600ft. will be bridged by means of a 'suspended span' - a large structure in itself to be built ashore, towed out to the centre of the harbour, hoisted 170ft. above water level, and secured to the ends of the cantilever arms with suitable eyebar and pin connections. "The bridge provides for four lines of railway and is designed so that four trains, each 1000ft. long, weighing 1 ton per foot, and headed by two 160-ton electrical locomotives, can be taken across the bridge at the same time, i.e., a trainload of 5200 tons. There will be a main roadway, 35ft. wide, to accommodate four lines of vehicular traffic, and when fully loaded the bridge can accommodate vehicles weighing 4000 tons. A separate motor roadway, 18ft. wide, will provide for fast motor traffic aggregating 1000 tons at any one time, whilst the footway, 15ft. wide, will allow some 36,000 people to walk over the bridge hourly, and. allowing for free but slow passenger movement, there could be 10,000 pedestrians, weighing nearly 700 tons, on the bridge at the same time. When fully loaded, the normal maximum load would be about 11,000 tons, whilst the bridge will be able to carry half as much again without exceeding the working stresses for which it is designed." 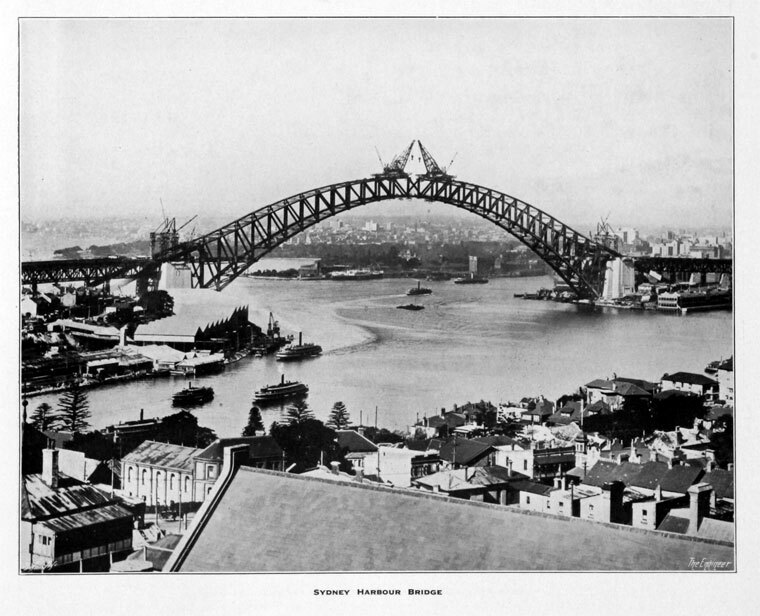 1922 "... Mr. Bradfield, Engineer to the State of New South Wales, has recommended the Australian Government to accept the tender of Dorman, Long and Co., Limited, for the construction of the North Shore Bridge at Sydney. The bridge was described in articles which appeared in THE ENGINEER of August 12th, 1904, and November 16th, 1908, and an extract from the specification was given in our issue of July 15th, 1921. It will link the North Shore to the city side of the harbour, and will have a total span of 3816ft., with a central span of 1600ft. At high water there will be a clearance of 170ft. The total width is to be 150ft., and the design prepared by Mr. Bradfield provides for a central roadway for vehicular traffic 57ft. in width, on either side of which is a double rail track, while two asphalted footways, each 9ft. 11.5in. in width, are arranged one at each outer side of the bridge. The total estimated cost of the bridge was approximately £6,000,000, and it is calculated that 35,000 tons of steel will be used in its construction. According to reports we have received, the price tendered by Dorman, Long, Limited, was £4,500,000, and that of Sir William Arrol and Co., Limited, £5,300,000. A clause in the contract provides that as far as possible material available or manufactured in Australia must be used." 1923 Construction began. It was to be a two-hinged spandrel braced-arch bridge with a clear span of 1650 feet and a deck 160 feet wide to accommodate four railway tracks, a roadway 57 feet wide, and two footways, each 10 feet wide. It was the heaviest bridge yet built, weighing 50,000 tons; its building involved the use of structural members of unprecedented weight and dimensions. "The proposed bridge across Sydney Harbour has been under consideration in New South Wales for over thirty years. 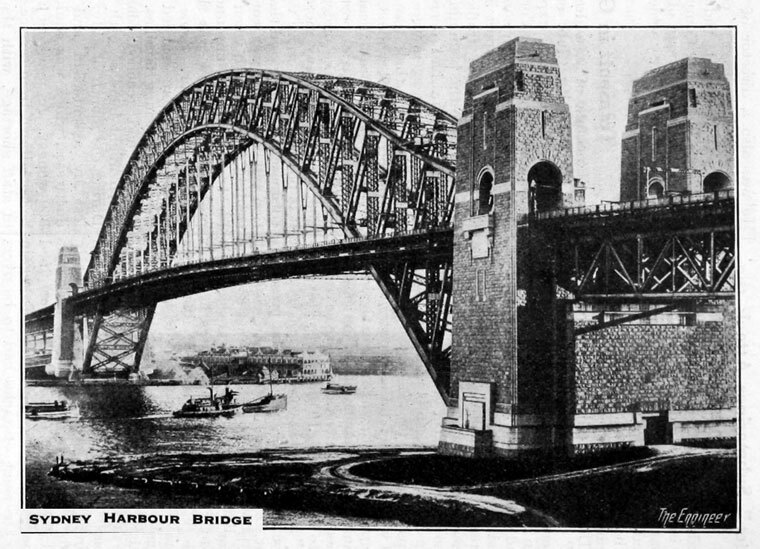 In view of the urgent necessity for improving communications the matter was taken up actively by the present Government and an Act of Parliament was passed in 1922 authorising the construction of a bridge to cross the harbour in one span at a height sufficient to allow the passage of the largest liners. "Specifications were prepared by Mr. J. J. C. Branfield, M. Inst. C.E. Chief Engineer of the New South Wales Government which defined the exact position. of the bridge and provided for four railway tracks as well as an 80ft. width of roads and footways, but threw upon tendering firms the entire responsibility for preparing the design and the erection scheme. In response to an invitation open to all the world tenders were submitted by two British, one Canadian and one American bridge-building firms. Tenders were also sent in by two Australian firms, and it is known that the project received the consideration of continental manufacturers. The specifications mentioned that importance would be at attached to the aesthetic features of the designs put forward. Dorman., Long and Co. devoted special attention to this, realising that a bridge of such great magnitude to be constructed in a situation unique in its natural beauty, must be inherently attractive in its outline and dimensions, and that any decorative or architectural features introduced should be in keeping with the character of the bridge and its surroundings. "The company submitted alternative designs for a cantilever bridge, a cantilever arch bridge, and an arch bridge with various arrangements of the architectural treatment and span making in all seven alternative tenders. The accepted tender is that for an arch bridge ...."
"Dorman Long and Co. have engaged the services as consulting engineers of Mr. Ralph Freeman M. Inst. C.E., M. Am. Soc. C.E., of Sir Douglas Fox and Partners, and Mr. G. C. Imbault, and the design and erection scheme have been prepared under their oersonal direction...."
1932 The bridge was completed and opened to traffic with four traffic lanes and four rail tracks. This page was last edited on 21 February 2018, at 12:38.